When it comes to protecting your business, it pays to have your water pipes inspected on a regular basis in order to detect and stop slow leaks. Many property managers, business owners and landlords erroneously believe that their property insurance policies will cover all types of water damage. This is not true. Most commercial property insurance policies only cover sudden water damage, like pipe bursts. They rarely cover water damage caused by slow leaks. To understand what your commercial property insurance covers, it’s best to read the policy, especially the exclusions. There are typically two types of water damage caused by plumbing pipes, including a burst pipe and a slow plumbing pipe leak, and any type of water or steam pipe can develop a leak, including HVAC pipes, radiator pipes, fire suppression system pipes, potable water pipes and irrigation pipes. Slow plumbing pipe leaks occur when a fitting is loose or a joint seam develops a hole. They can also be caused by pinhole leaks in metal plumbing pipes. Slow leaks are not typically identifiable because the water often drips slowly from the plumbing pipe. However, slow leaks can cause damage in the form of mold, mildew and structural damage if they are not found and repaired in a timely manner. Burst pipes occur when the pipe is severely corroded, the water pressure is too high or the pipe freezes in the middle of winter. When a pipe suddenly breaks, it creates a cascade of water that can damage floors, drywall and ceilings. The flooding water can even damage the lower floors of your building if the burst pipe occurs on an upper floor. When it comes to determining what types of water damage are covered by commercial property insurance in Chicago, it is best to read your policy and ask your insurance agent specific questions about your coverage. Most commercial property insurance policies do cover burst pipes, but they may not cover water damage from a slow leak. This is because most insurance companies look at slow leaks as a failure of the property owner to get timely preventative maintenance or as the result of negligence. 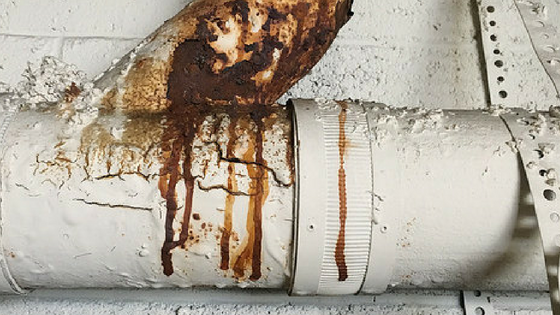 If you feel as though your Chicago building needs a policy that covers slow leaks due to the age of the building, it’s best to talk with your insurance agent to see if a special insurance policy can be written that covers slow plumbing pipe leaks. If you are worried about water damage from slow leaks due to pipe corrosion or the age of your plumbing pipes, Nu Flow can help. Our pipe lining experts can evaluate your plumbing pipes to determine their ages and corrosion levels and to find small pinhole leaks that may be causing hidden water damage. If we do find damage, corrosion or signs of leaks during our inspection, we will tell you if your pipes are good candidates for pipe lining and provide you with an estimate. The pipe lining process involves locating an existing access point in order to attach the pipe lining equipment, thoroughly cleaning all the corrosion and scale from your plumbing pipes and blowing an epoxy coating through your plumbing pipes in order to seal existing leaks and prevent water from coming into contact with the host pipe. Once we are finished, we will perform a camera inspection to ensure the coating have been evenly distributed. We can even show you the footage of your plumbing pipes before and after pipe lining. For more information on our pipe lining services and how they can help protect your business against burst pipes and slow water leaks, call us today at 815-790-9000. 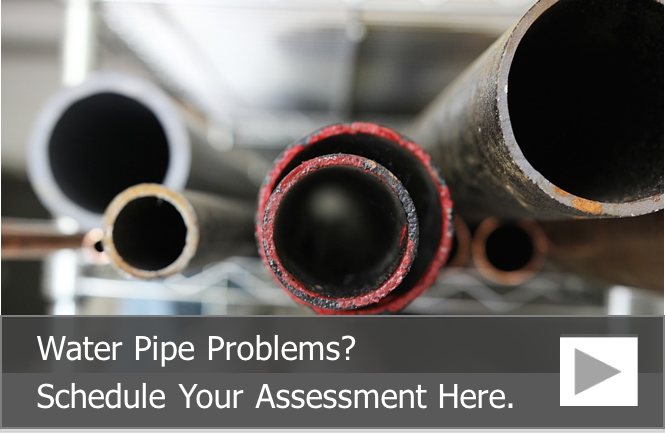 We also offer building pipe assessments.